Stock #4104, Retail Price $29.95. New Game Value: Seven new ships (on huge 8.5x11 cards) and a full-scale starbase, multiple scenarios. This product requires Romulan Border or Klingon Border for use. It will also work with Academy. 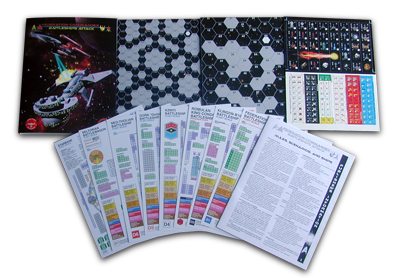 Components: 16-page Ship & Scenario guide, 108 half-inch and 40 one-inch full color die cut playing pieces, eight full color over-sized double-sided laminated ship cards, and two 8.5x11 hard-mounted double-sided map panels (with asteroids). 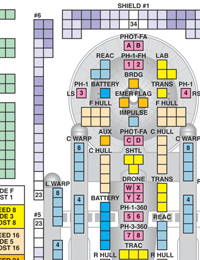 Romulan King Condor, Gorn BB, Kzinti BB, Neo-Tholian BB, Seltorian BW; starbase, Federation Mars, Klingon B10. Border Box #6 provides Seven battleship miniatures and a starbase. Stock number 4406; retail $99.95. Boosters #16, #17, and #18. Unlike previous boosters, these do not provide additional cards for the main product. Instead, each booster provides eight cards for Dreadnoughts and Dreadnought variants (at least five new cards per booster).Stock #s 4216, 4217, 4218; $9.95. 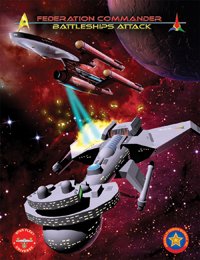 Klingon Border or Romulan Border include all required rules for the ships in this product. This product requires one of those products. It will also work with Academy.